The two biggest changes I’ve noted since I did this analysis last year are (1) the emergence of autonomous systems in both the physical and virtual world and (2) startups shifting away from building broad technology platforms to focusing on solving specific business problems. With the focus moving from “machine intelligence as magic box” to delivering real value immediately, there are more ways to bring a machine intelligence startup to market. (There are as many ways to go to market as there are business problems to solve. I lay out many of the optionshere.) Most of these machine intelligence startups take well-worn machine intelligence techniques, some more than a decade old, and apply them to new data sets and workflows. It’s still true that big companies, with their massive data sets and contact with their customers, have inherent advantages — though startups are finding a way to enter. In last year’s roundup, the focus was almost exclusively on machine intelligence in the virtual world. This time we’re seeing it in the physical world, in the many flavors of autonomous systems: self-driving cars, autopilot drones, robots that can perform dynamic tasks without every action being hard coded. It’s still very early days — most of these systems are just barely useful, though we expect that to change quickly. These physical systems are emerging because they meld many now-maturing research avenues in machine intelligence. Computer vision, the combination of deep learning and reinforcement learning, natural language interfaces, and question-answering systems are all building blocks to make a physical system autonomous and interactive. Building these autonomous systems today is as much about integrating these methods as inventing new ones. The virtual world is becoming more autonomous, too. Virtual agents, sometimes called bots, use conversational interfaces (think of Her, without the charm). Some of these virtual agents are entirely automated, others are a “human-in-the-loop” system, where algorithms take “machine-like” subtasks and a human adds creativity or execution. (In some, the human is training the bot while she or he works.) The user interacts with the system by either typing in natural language or speaking, and the agent responds in kind. These services sometimes give customers confusing experiences, like mine the other day when I needed to contact customer service about my cell phone. I didn’t want to talk to anyone, so I opted for online chat. It was the most “human” customer service experience of my life, so weirdly perfect I found myself wondering whether I was chatting with a person, a bot, or some hybrid. Then I wondered if it even mattered. I had a fantastic experience and my issue was resolved. I felt gratitude to whatever it was on the other end, even if it was a bot. On one hand, these agents can act utterly professional, helping us with customer support, research, project management, scheduling, and e-commerce transactions. On the other hand, they can be quite personal and maybe we are getting closer to Her — with Microsoft’s romantic chatbot Xiaoice, automated emotional support is already here. As these technologies warm up, they could transform new areas like education, psychiatry, and elder care, working alongside human beings to close the gap in care for students, patients, and the elderly. Many machine intelligence technologies will transform the business world by starting in regulatory grey areas. On the short list: health care (automated diagnostics, early disease detection based on genomics, algorithmic drug discovery); agriculture (sensor- and vision-based intelligence systems, autonomous farming vehicles); transportation and logistics (self-driving cars, drone systems, sensor-based fleet management); and financial services (advanced credit decisioning). Startups are making a global arbitrage (e.g., health care companies going to market in emerging markets, drone companies experimenting in the least regulated countries). The “fly under the radar” strategy. Some startups are being very careful to stay on the safest side of the grey area, keep a low profile, and avoid the regulatory discussion as long as possible. Big companies like Google, Apple, and IBM are seeking out these opportunities because they have the resources to be patient and are the most likely to be able to effect regulatory change — their ability to affect regulation is one of their advantages. Startups are considering beefing up funding earlier than they would have, to fight inevitable legal battles and face regulatory hurdles sooner. The corporates wanted to know what current business problems these technologies could solve. They didn’t care about the technology itself. The machine intelligence companies, on the other hand, just wanted to talk about their algorithms and how their platform could solve hundreds of problems (this was often true, but that’s not the point!). Enterprises have invested heavily in becoming “machine intelligence literate.” I’ve had roughly 100 companies reach out to get perspective on how they should think about machine intelligence. Their questions have been thoughtful, they’ve been changing their organizations to make use of these new technologies, and many different roles across the organization care about this topic (from CEOs to technical leads to product managers). Many machine intelligence companies have figured out that they need to speak the language of solving a business problem. They are packaging solutions to specific business problems as separate products and branding them that way. They often work alongside a company to create a unique solution instead of just selling the technology itself, being one part educator and one part executor. Once businesses learn what new questions can be answered with machine intelligence, these startups may make a more traditional technology sale. I remember reading Who Says Elephants Can’t Dance and being blown away by the ability of a technology icon like IBM to risk it all. (This was one of the reasons I went to work for them out of college.) Now IBM seems poised to try another risk-it-all transformation — moving from a horizontal technology provider to directly transforming a vertical. And why shouldn’t Watson try to be a doctor or a concierge? It’s a brave attempt. In the machine intelligence world, founders are selling their companies, as I suggested last year — but it’s about more than just money. I’ve heard from founders that they are only interested in an acquisition if the acquirer has the right data set to make their product work. We’re hearing things like, “I’m not taking conversations but, given our product, if X came calling it’d be hard to turn down.” “X” is most often Slack (! ), Google, Facebook, Twitter in these conversations — the companies that have the data. Until recently, there’s been one secret in machine intelligence talent:Canada! During the “AI winter,” when this technology fell out of favor in the 80s and 90s, the Canadian government was one of a few entities funding AI research. This support sustained the formidable trio ofGeoffrey Hinton, Yoshua Bengio, and Yann LeCun, the godfathers of deep learning. Canada continues to be central to the machine intelligence frontier. As an unapologetically proud Canadian, it’s been a pleasure to work with groups like AICML to commercialize advanced research, the Machine Learning Creative Destruction Lab to support startups, and to bring the machine intelligence world together at events like this one. Machine intelligence is even more of a story than last year, in large companies as well as startups. In the next year, the practical side of these technologies will flourish. Most new entrants will avoid generic technology solutions, and instead have a specific business purpose to which to put machine intelligence. I can’t wait to see more combinations of the practical and eccentric. A few years ago, a company like Orbital Insight would have seemed farfetched — wait, you’re going to use satellites and computer vision algorithms to tell me what the construction growth rate is in China!? — and now it feels familiar. Similarly, researchers are doing things that make us stop and say, “Wait, really?” They are tackling important problems we may not have imagined were possible, like creating fairy godmother drones to help the elderly, computer vision that detects the subtle signs of PTSD, autonomous surgical robots that remove cancerous lesions, and fixing airplane WiFi (just kidding, not even machine intelligence can do that). Overall, agents will become more eloquent, autonomous systems more pervasive, machine intelligence more…intelligent. I expect more magic in the years to come. Many thanks to those who helped me with this! Special thanks to Adam Spector, Ajay Agrawal, Angela Tran Kingyens, Beau Cronin, Chris Michel, Chris Nicholson, Dan Strickland, David Beyer, David Klein, Doug Fulop, Dror Berman, Jack Clark, James Cham, James Rattner, Jeffrey Chung, Jon Lehr, Karin Klein, Lauren Barless, Lynda Ting, Matt Turck, Mike Dauber, Morgan Polotan, Nick Adams, Pete Skomoroch, Roy Bahat, Sean Gourley, Shruti Gandhi, Zavain Dar, and Heidi Skinner (who designed this graphic). 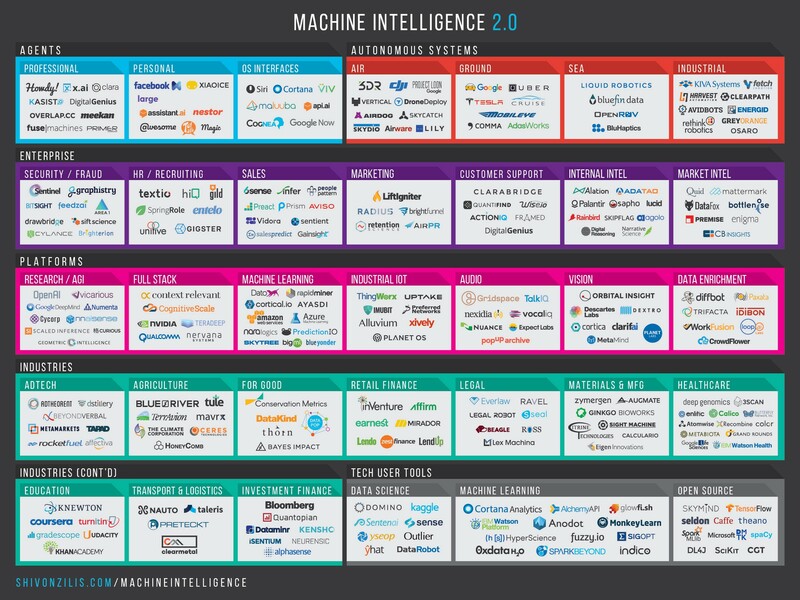 Disclosure: Bloomberg Beta is an investor in Alation, Adatao, Aviso, BrightFunnel, Context Relevant, Deep Genomics, Diffbot, Domino Data Lab, Gigster, Graphistry, Howdy, Kaggle, Mavrx, Orbital Insight, Primer, Sapho, Textio, and Tule. Partner at Bloomberg Beta. All about machine intelligence for good. Equal parts nerd and athlete. Straight up Canadian stereotype and proud of it. Perspectives and opinions on artificial intelligence and machine learning.